Italian iconic footballer Francesco Totti has been with his Roma side for 21 years. That’s probably longer then Mario Balotelli has been alive. And the 2010 season for the team’s captain has had the roughest start of any in his career. The Giallorossi have only won a single match this season following six matches and the side currently resides in 19th place on the league table. And perhaps to make the experience that much more painful for Totti, the thirty four year old forward has yet to score a goal in five starts this season. 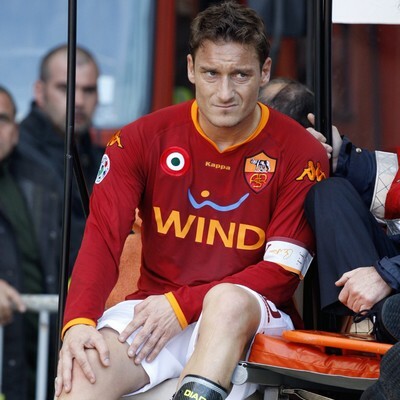 As the captain of the team Totti feels responsible for the terrible start to the season and recently suggested that if he is the team’s problem then he will gladly step aside and retire from the game. Totti expressed that he doesn’t want to the team’s “problem” or “burden” and admitted that if the team’s officials think his game has faded to tell him, so that he can step out of the way of the program. I would never allow myself to be put in a situation of privilege with respect to the other Roma players. Moreover as the captain of Roma I confirm that I don’t want to be this team’s problem. If whoever with the decision-making power in this club believes that I have become a problem for this club, they must say so to me, then I can make my decision because I don’t want to be a burden on anyone. I have always been and will always be available to this team and these colours to try and make our fans dream and to make our Roma win. Although it is true that Totti’s game has declined over the years (he was one of the best in the world at one point after all), he still is better then your average player and is definitely not done as a player. Totti scored 14 goals last season and 13 the year before that. Those numbers will likely drop each year from here on out, but there is no reason why the vet can’t manage 10 goals this season. Totti might not be as good as he once was, but after just five starts you have to consider what he is going through as just a cold streak and not a permanent loss of his game.